Our range of products include student polarimeter (laurents half shade), student polarimeter, research polarimeter rsp-10b, research polarimeter rsp, astronomical and terrestrial telescope combined and l-shaped cathetometer. Specially designed for easy to use, moderately priced, for colleges and research laboratories. Ideal for determining the specific rotation of optically active substances. Our Polarimeters are now extensively used in industrial laboratories as well. A corning glass tube is enclosed in a circular aluminum tube with top door for access and exclusion of external light. The circular scale is attached near the analyzer and the range of measurement is 0-360°. A movable Vernier on the scale enables reading of optical rotation to 60 seconds. Worm and gears combine rough and fine adjustment, provided with Half Wave Mica Plate, giving three parts field for easy setting, adjustable half shadow angles. 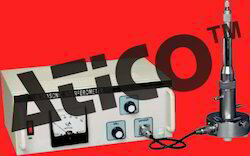 This instrument can be used on monochromatic light only. When light passes through a polarized sheet and then through the solution, the emerging light is observed through rotatable polarized lens, analyzer which is used as eyepiece. The angle of light is rotated and read directly on the circular scale. Supplied on the adjustment stand, Packed in cardboard box with working manual. • Having angular and sugar scale from 0° to 360° and +130° to –30° I.S.S. 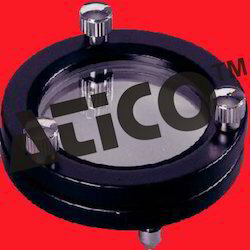 Sub divided into 0.10 micrometer drum enable to read upto 0.05° by estimate workable for use with polarimeter tube 200mm. • Analyser : Glans Thompson Prism. A high class telescope for school students for all-around purpose. 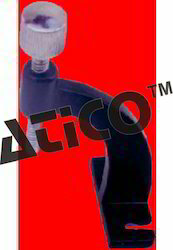 It is light and easy to manipulate and has a high magnifying power. 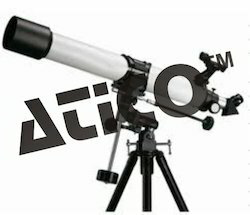 Overall length of Astronomical Telescope is 85 cm, fitted with high class achromatic objective of dia 45 mm, focal length 18” inches. Its high magnifying power that provides extremely sharp images. The telescope is provided with an extra erector tube which can be screwed into the main tube after removing the eyepiece and this Astronomical Telescopes is used as a Terrestrial Telescopes. Complete with velvet lined case. Superior quality with high class achromatic objective . The body of the instrument is fixed, with a leaning of 60 . Correct Refractive Index and Sugar Percentage can be read directly in the field. It consists of Abbe’s Double Prisms with the Thermostat, Compensator, Telescope Mirror, Limb, Graduated Sector, Reading Magnifier and Radical Arm which carriers a Vernier. Abbe’s Double prisms leaves a narrow space (about 0.1 mm) between the adjoining faces of the prisms. 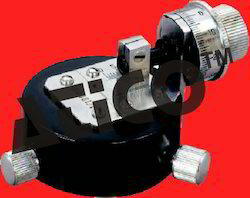 Compensator consists of the Amici Prisms which serve for reading the line of Ach. Separation. 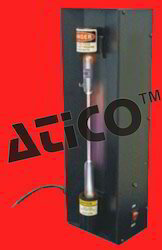 For measuring the thickness of thin articles by optical method. Optical work 40mm dia plain mirror mounted on a metallic arc. The arc is mounted on a aluminium metallic base with two fixed legs and one levelling screw. 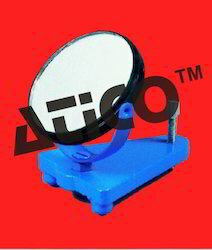 Advanced Technocracy Inc. is Manufacturer, Exporter & Supplier of Spare Scale And Scale Holder For Reading Telescope. • The cone bearings are of selected material and the upper and lower parts of the arms are turned and ground in one operation giving the most accurate alignment. Clamps for telescope and prism table are designed so that no strain cones on the cone bearings from clamping, thus avoiding any disturbance of the axial alignment. 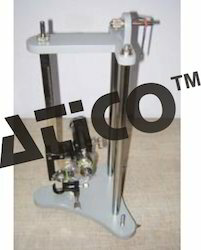 • Scale 10” from lifetime brass scale, divided on the latest dividing machines. Accuracy of calibration within ±0.01%. Adjustment is provided to verniers for very fine opposition to the scale. The slit jaws are from stainless steel finely ground and the jaw movement is free of any spring action ensuring perfect parallelism at all openings. 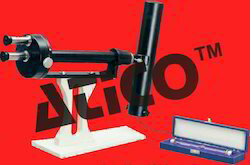 • Fine adjustment to the telescope and collimator tubes are provided laterally as well as vertically. • Clamping devices are provided to lock the telescope and collimator after adjustment. • The instrument is finished in a pleasing and practical finish & collimator fitted with special circular slit. •10” with Brass Scale with vernier reading 10 seconds. : The 177 mm diameter circle is fixed and both the telescope and table are fitted with independent double ended verniers reading to 30 seconds of arc and have independent fine and coarse movements. While coarse adjustment is done by releasing the clamping screw and moving by hand, fine adjustment is made by engaging the clamping screw and moving the tangent screw. :Mounted on a fixed pillar. At one end is fitted 32mm dia clear aperture, 175mm focus achromatic objective and at the other end a 6mm long unilaterally adjustable slit. :Mounted on a movable pillar. At one end is fitted 32mm dia clear aperture 175mm focus achromatic objective and at the other end a 15X Ramsden eyepiece and a glass crossline graticule. 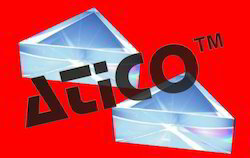 Both telescope and collimator have rack and pinion systems for focusing the objectives and means for levelling their optical axes and squaring them to the axis of rotation. 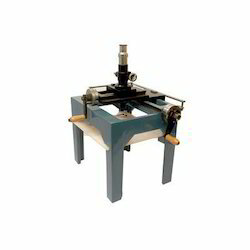 :The 85mm diameter table is marked with lines to assist positioning of the prism with respect to levelling screws and has interchangeable clamping units for the prism and diffraction grating. :1 Dense flint glass prism, 1 Prism clamp, 1 Diffraction grating holder, 1 Magnifier glass, 1 Tommy bar for adjustment of optical axes, 1 Dust cove, 1 Wooden case. Our Advance Student Spectrometer is a solidly - constructed instrument, thoughtfully provided with features and accessories that assist students in making precise measurement of spectral lines or prism angle. High Quality, large aperture optics produce sharp spectral images, while precision machining allows for precise rotation and accurate measurement. Resolution to 1 minute of an Arc. The 125mm or 150mm diameter, precision engraved degree plate is complemented by 2 precision engraved verniers, one on each side of instrument for convenient reading. Aperture : 25 mm (adjustable by pinion & rack), adjustable rectangular slit. Aperture : 25 mm (adjustable by pinion & rack), fitted with 10x Ramsden eyepiece with cross line graticule. Ramsden x10 fitted with cross wire. Located on the plate, it enables you to precisely position the prism & diffraction grating. Supplied in wooden case. Reading minute : 1min. or 30 sec. The specification is spectrometer is designed to meet the demands of a standard instrument for degree colleges and in technical labs. Lifetime 178mm stainless steel scale and verniers, calibrated on the latest dividing machines to give maximum accuracy. In our 7” spectrometer we provide special circular slit to the collimator. 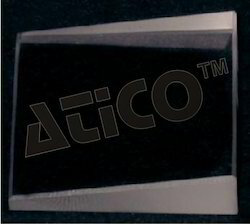 The slit of the collimator is from close grained stainless steel and slit jaws are finished and ground with the utmost care and optically tested for the accuracy of the edges. The two jaws are operated by a knurled ring and moves symmetrically from the centre and remain parallel at all openings. Supplied in a superior quality wooden box. Vernier reading 1 minute. 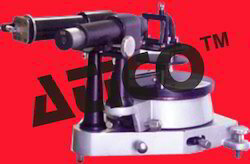 We are also providing up & down motion to collimator as well as to telescope. 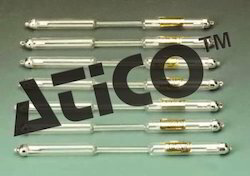 It is an instrument for the measurement of small lengths e.g. the diameter of Newton’s rings and narrow tubes etc. It consists of a compound Microscope mounted vertically or horizontally on a right metal frame so that it can be moved in a direction at right angles to its axis by means of a screw. The displacement of microscope is measured with verniers which moves with the microscope along a scale fixed to the instrument. Base: Properly painted heavy cast iron base, with two levelling screws. Top surface is machined for smooth sliding of a carriage having clamping screws for locking. Horizontal Scale:The horizontal scale fitted in the bed of the machine divided on a life time stainless steel to a length of 0 to 20 cm in 0.5mm division. Vertical Scale: The vertical scale fitted on the vertical pillar is also machine divided on a lifetime stainless steel to a length of 14cm graduated in 0.5mm division. Verniers: Horizontal and vertical verniers, are provided. (Both are 50 divisions, such that 50 vernier scale division coincide with 49 main scale division). Sliding Carriage: Sliding carriage slides along vertical metal bar of special design which is fitted on the horizontal carriage with slide on the top of the base. Fine motions screws are provided for fine adjustment both for horizontal and vertical movements. The Slow Motion Guide Bar: The horizontal fine motion range is especially increased to app. 3cm for convenience. In taking measurements within this range, in one operation of the slow motion screw, without recourse to sliding adjustment of the carriage (The movement has obvious advantage for fine measurements falling with this extended range.) Vertical fine motion range is approx. 2.5cm. Microscopes: Microscopes fitted on a vertical carriage can be clamped in vertical or horizontal or vertical plane of the Microscope. Eye piece is of Ramsden type and fitted with fine cross line graticule. 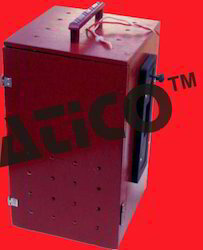 Objective achromatic with a working distance of 50mm or 75mm approximately, focusing can be done by rack & pinion. Objective and Eye Piece: Consisting of 10 x Ramsden eye piece and 2” or 3” focal length objective from highest quality optical glass. The instrument is finished in the latest polychromatic finish with chrome plated brass parts. Supplied in a superior quality wooden box along with dust cover & instruction manual. 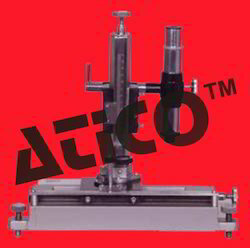 For certain measurements it is more convenient to provide sliding motion to the microscope tube across the stage, in addition to all other usual movements. (This microscope is very useful in Newton’s ring experiment and graph reading etc.) A sliding carriage is fitted on the top carriage which moves at right angle to the horizontal motion by means of rack and pinion. This motion is also graduated in millimeters with a vernier reading of 0.1mm. Supplied in a superior quality wooden box. • Square brass pillar, in which inlaid lifetime stainless scales. • Cross line graticule is provided in the eyepiece. Special Feature : Horizontal & Vertical verniers, in both case, drum types vernier are provided for Direct Reading (Easy Reading) . 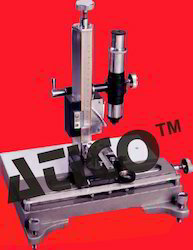 The Co-ordinate Measuring Microscope is characterized by carefully lapped micrometer screws and nuts provided with compensating spring device to eliminate back-lash and to minimize its development after prolonged use. The linear carriage, carried on a rugged and aged cast frame, is provided with Micrometric motion through its entire 20cms. Range, read to 0.0001 cm directly on the Micrometric head. Micrometric heads are made of gun metal. A compensating spring device minimises development of back-lash after constant use over a long period. The machined opposing surfaces of the carriage and the frame and interground to give an oil smooth movement free from any lateral shift. 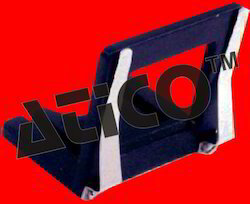 The cross carriage is carried on the linear slide and has a range of 10cms. Read directly to 0.0001 cm on the micrometer head. The lifetime stainless scales are precision machine divided on the latest machines to give maximum accuracy. Micrometer drum heads are of large dia divided to read directly to 0.0001 cm. 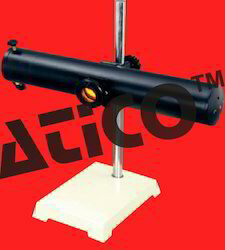 The microscope tube is provided with rack and pinion focusing and is fitted with finest achromatic optics. The instrument is supplied with 3” objective and 10x Ramsden eyepiece with cross line graticule. Supplied in wooden box but W/O any accessories. 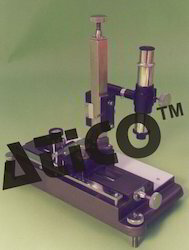 The Co-ordinate Measuring Microscope is characterised by carefully lapped micrometer screws and nuts provided with compensating spring device to eliminate back-lash and to minimise its development after prolonged use. 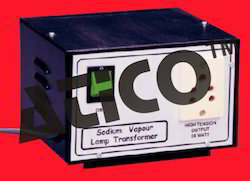 A very efficient 12 V 100W quartz iodine lamp mounted in a well ventilated metal housing. Apertures 19 mm diameter are provided on two adjacent sides so that the lamp may be used either as an intense horizontal 'line' source, or end-on as a powerful 'point' source. The aperture not in use may be closed by a pivoted shutter equipped with a lock screw. The lamp house is mounted on a rod 160mm longx10mm diameter for supporting from an ordinary laboratory stand. Dimensions of lamp house 78x78x153mm. Supplied complete with 1mm of twin cable. Advanced Spectrometer Deluxe Type 6"
Specifications are same as per Cat No. 1578, only fine adjustment to the telescope and collimator tubes are provided laterally as well as vertically. This system is manufactured in 6"spectrometers only and provided with stainless steel scale . - Vernier reading 1 minute. The telescope and collimator are held in support rigidly and in perfect alignment. 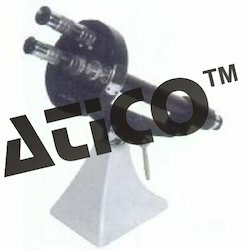 Vertical adjusting screws are provided to both the telescope and collimator. Clamping devices are provided to lock the telescope and collimator after adjustment i.e. fine adjustment to the telescope & collimator tubes are provided laterally as well as vertically. 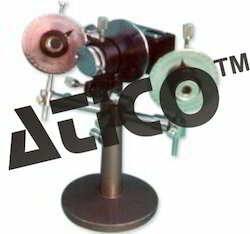 We are offering replica imported diffraction grating etc. We offer replica imported diffraction grafting that is made on glass plate and covered with another glass plate. The replica imported diffraction grafting we offer provides 100, 200, 300 and 600 lines per mm. 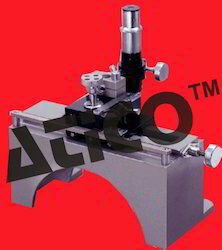 All metallic diffraction grating clamp type and is fitted with two micrometers screw slides forming a double slit with fine edges in the centre of the vertical clamp holding device. Very superior quality. Supplied with or without rod. 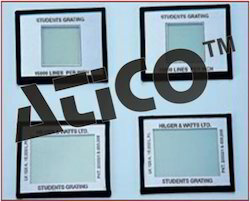 Spare Grating Holder suitable for all types of Spectrometer . All brass black painted. 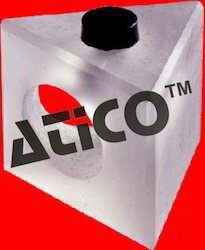 Made of ordinary glass plates properly cemented with optical cement. 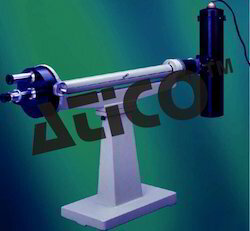 • A Basic measuring instrument for quantitative spectroscopy experiments, this instrument is mounted on a stable cast iron base with attached collimator and a rotating telescope platform and graduated circle. • A 2.4cm. Diameter achromatic optical system with a 10x Ramsden eyepiece & cross line graticule. • An 8 cm. Diameter prism/grating Table, fully adjustable with prism & grating holders and engraved ring pattern. Protected Circle15.0 cm with S.S. Scale. • Vernier reading 1 minute. Supplied in a wooden case with 2” Brass spirit level. The travelling microscope consists of a cast iron base with machined vee-top surface and is fitted with 3 leveling screws, one being fixed. The microscope can travel horizontally 18cm and vertically 15cm with the help of slides. The slow motion knobs are provided for taking accurate readings. Vernier readings 0.01mm. The Microscope tube consists of an eyepiece 10X with 50mm or 75 mm objective, for holding objects horizontal stage, made of milky cenolite sheet provided on the base packed in beautiful wooden box. We have introduced new source of light. LED light source (in red colour). LED is housed in a special Aluminium case with 2 set of lenses. LED operates on a specially designed IC regulated power supply. 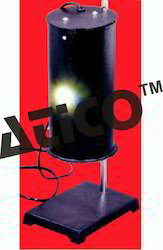 Mercury Vapour Lamp is supplied. With a rated output of 80W, this source provides sufficient intensity for almost any experiment. With a good light source, student can investigate energy levels using a spectrometers. An 80 Watt choke of excellent quality is clamped on a heavy steel cabinet. An Anchor make piano type switch ad 5-pin socket is provided for on/off and output respectively. It consist of metallic box with two narrow slit. The spacing between these two slits are very very small of few mm. The metal box is fitted with electrical fitting for ordinary bulb. When the bulb glows, the slits are illuminated and one can resolve two narrow slits through reading telescope. The Iron sheet box is round in shape & mounted vertically on a heavy cast metal stand. Only one slit is provided. Bulb holders & lead of finest quality are fitted in box to give you trouble free working for long life. 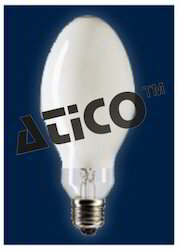 Suitable for 80W lamp. Supplied without lamp & choke. This aluminium metal box is round in shape & mounted horizontally on a sturdy metal base. Box is provided with one slit fitted with iris diaphragm to control the intensity of light. Bulb holders & lead of finest quality are fitted in box to give you trouble free working for long life. This mount is suitable for 35W as well as 55W Lamp. Supplied without bulb & transformer. Narrow Angle Prism optically worked made with white glass 32x32mm size. Comprising a small wooden frame of size 5”x3”x3” with a matt blackened inside and provided with a glass plate 4” x 3” x 1/8 0 mm mounted at an angle of 45 to reflect the light downwards on to a Plano-convex lens of 50mm diameter having 100 cm focal length which rests on a plain glass plate 3” x 3” x 3/8 on the base of the box. 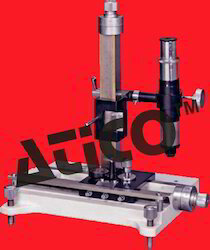 Newton’s Ring MicroscopeA standard Microscope unit having 30x magnification is provided with a rotatable cross line and the eye piece can be focused as per individual’s requirement. 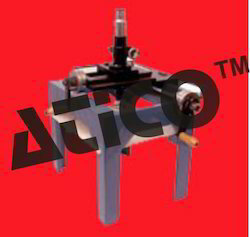 The whole microscope tube unit can be raised or lowered and can be clamped in any desired position. 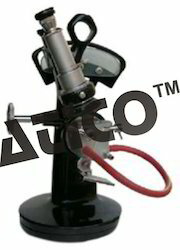 The focusing of the microscope unit is done by rack and pinion arrangement. The longitudinal movement of the microscope saddle for the purpose of the Rings is done by rotating the drum. The 26 mm movement can be read by scale and on the divided drum to 0.001 cm. Newton’s Ring set consisting of the optical flat glass and one Plano-convex Lens (50mm radius) arranged inside a metal case resting over the stage of the instrument which can be adjusted for the alignment of the measuring line . An adjustable reflector plate in the required direction is fitted on to the side of the set. The condenser lens is provided in front of the reflector. This apparatus consists of two identical units, each provided with Polaroid disc mounted in a rotatable mount, with aperture of 25mm. Both rotatable mounts have a lever to add rotation and a pointer which traverses a 75mm diameter brass silvered scale divided into 360°×1. The size is universal and can be fitted to any size of collimator and telescope. To fit over the object end of telescope and colimator. Spare Prism Holder suitable for all types of Spectrometer. All brass black painted. Nature of Glass R.I. Approx. Complete with Cross wire graticule along with brass holder and eyepiece. All metallic diffraction grating clamp type and is fitted on prism table of spectrometer for interference of light experiment. Supplied with or without rod. 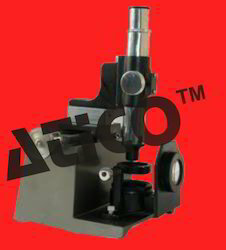 Microscope: Mounted on a travelling carriage fitted with 10x Ramsden eye piece, cross-line graticule, Achromatic object 75mm working distance, focussing by rack & pinion. Scale: Graduated in half millimeters on inlaid strip of nickel silver, vernier attached, Microscope traverse, 16.5 cm. 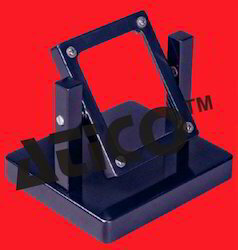 Base: Heavy cast iron, top nicely machined, travelling carriage slides on the top, which can be clamped in any position. Fine motion screw for finer adjustment. Complete with case. Motion : Special design measure object in X as well as in Z direction. Either Philips or Osram make Sodium Vapour Lamp is supplied. This low pressure Sodium Vapour lamp works better than 99% of the visible output, concentrated in 5889 0 & 5895º A Spectra lines. 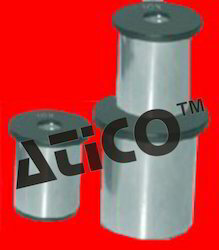 High grade lamination are used to avoid losses. The box is made from a thick metallic sheet. 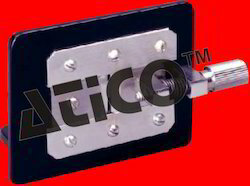 An Anchor make piano type switch is provided for on/off operation and a1.6m, 3 core flying lead is provided for main connection and output is via a special Anchor make 3 Pin socket is provided to avoid shock due to the leakage of the current. 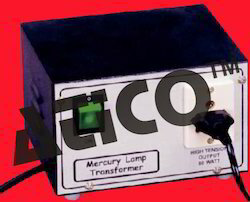 This transformer is an Auto Leak type, giving a starting voltage 440 V which automatically reduces when the lamp has struck. This system is easy-to-use and inexpensive, with a variety of safety features that make it suitable for beginning labs. Mount any of the 8 different spectral tubes into the power supply and turn it on. The 26 cm long tubes are capillary-thin over the middle 10 cm, providing sharp, bright spectra. Student Safety: The tubes mount from the front of the supply and snap into moulded sockets that fully enclose the conductive ends. The allmetal case is electrically grounded. Spectral Tube Safety: A current limiting transformer protects the tubes. A protective shield also helps safeguard the tubes, while blocking unwanted ambient light for clear viewing. 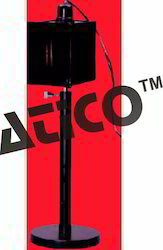 Power Requirements : 220 VAC, 50 Hz. Experiments may be performed over a wide range of 0 0 temperature from +30º C to +80º C on all liquids except those which reacts with the plating of the cell and crystal. There is no danger of any change, such as depolymerisation, due to ultrasonic effect since a very small ultrasonic energy is required. Adjustment for Resolving Power of Telescope. The box is rectangular in shape and provided with slits on three sides equally spaced to enable three experiments to be performed simultaneously using one light source. Each slit is provided with a cover so that it can be closed when not required. Bulb holders of finest quality are fitted in wooden box with special cord. Looking for Optical Sectional ?